The AJ-HD1200A DVCPRO HD AC/DC-powered, multi-purpose VTR, the first recorder* to offer an IEEE 1394 interface operating at 100Mbps data rate with DV High Definition video streams. The AJ-HD1200A is a key component in the company's collaboration with Apple to bring real-time professional quality, native HD editing to Power Mac and PowerBook customers, at a fraction of the cost of other systems. Grips are also attached for easy carry. 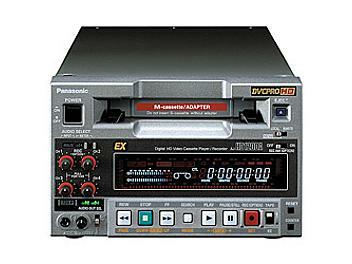 The unit uses 1/4-inch wide cassette tapes. the signals of the system selected. switching the setting on the system menu.